FORBES: 4 Ingenious Technologies to Help Aging Adults Stay Connected + Engaged – Goodthink Inc.
Every time I get annoyed with my husband for playing chess on his phone, I remind myself that he’s actually engaging my 71-year-old father in an epic, but friendly battle online. Through ongoing connection and affectionate trash talk, my husband and father have forged an enduring friendship that extends way beyond their screens. And for that, I’m eternally grateful. Although most people don’t think aging and technology go together, the truth is that generational interests are changing almost as fast as technology itself is. Stereotypes, on the other hand, take much longer to overcome. A 2016 AARP study found that even though seniors have a high willingness to try new technologies, more than 80% of caregivers thought they would have difficulty convincing their loved one to adopt a new device or gadget. However, data is showing that once seniors are comfortable with new technology, they become avid users. For instance, even though only 30% of the Silent Generation (ages 73-90) owns a smartphone, 77% of these seniors are getting online multiple times a day. Connected tech offers a balm for loneliness, isolation, and limited mobility that becomes increasingly relevant with age. With the senior tech market poised to reach $42 billion by the year 2020, industry leaders would be smart to think about how tech can go beyond medical devices and extend into entertainment as well. Another study by the Pew Research Center reveals that for many aging adults, tiny fonts and buttons are barriers to entry. However, with the aid of a family member or caregiver, these challenges can be overcome with a few setting modifications. Perhaps a bigger hurdle is demonstrating to an aging senior that there is a clear value proposition for them that warrants having to wrestle with a new device. In other words, seniors want to know what these technologies will do for them. Will this device improve their health, memory, sense of connection, quality of life, or long-term happiness? Research shows that when purpose can be demonstrated, seniors become avid users. For instance, 70% of seniors over the age of 50 now engage on social media, and 91% of those do so specifically to connect with friends and family. 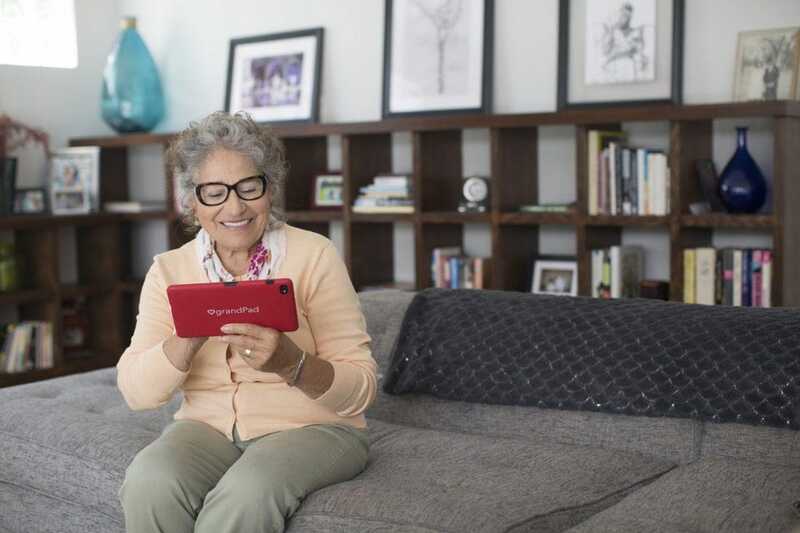 Connection: GrandPad is a tablet designed just for seniors with a simplified set of 11 apps that use large, clearly labeled icons (for video and voice calls, photos, email, music, games, news, weather and search). The charged and configured tablet comes in a box designed for seniors, so it’s easy to open. Photos and contacts are preloaded on the device by family, so no passwords or setup are required. Only people on the approved contacts list can send messages and there’s a live support person on call 24/7. Experience/Adventure: MyndVR aims to put smiles on seniors’ faces through Virtual Reality experiences that enable them to relive meaningful memories and/or visit places outside of their normal environments (think outer space, the Great Wall of China, or the Fjords of Norway). The concept has been wildly popular with seniors in trial populations who enjoyed the ability to step outside of their physical limitations and have a bit of fun. Within the first six months of launching in 2018, MyndVR has expanded to over 15 states and has started collaborating with leading universities to research the potential cognitive health benefits of using VR with aging populations. Memory: Aura Frames offers an elegant, smart, cloud-based digital photo frame that enables family members to remotely fill a loved one’s home with special pictures that can trigger both old memories and help to create new ones. Photos can be instantly uploaded via an app that can pull pictures from your smartphone services like Google Photos. Each of these technologies offers a clear value-add for aging seniors and incorporates design principles that transcend physical limitations of age and ability. Not only do these devices provide a positive way for seniors to spend their time, but they also tap into cognitive benefits that trigger feelings of long-term happiness. So the next time you are looking to connect with an aging loved one, consider some of these curated tech options as a way to invest in your relationship and deepen your experience of life together.